Some of us had a little doll-related fun on Twitter today. Liz Covart (of Benjamin Franklin’s World) went in search of Betsy Ross Barbie, and was amazed to find it; Marla Miller, who first tipped us off to the existence of this Barbie, suggested that we all immediately Google “George Washington Barbie,” which of course we did. I’ve got a barbie none can beat, friends–my Ursuline Barbie! But enough about my dolls; I’m here to tell you that I’ve been thinking about all of my book-related dolls and historical dolls in general while I’ve been walking around Québec this week, as Québec (like France) seems to have a weird fascination with both larger- and smaller-than-life representations of the human form. That is to say, I’m a huge fan of dolls, and even I’m a little creeped out by it. Statue of Marie Bourgeoys, Eglise de la Sainte-Famille, Isle d’Orleans, Quebec. Some of this no doubt has to do with me and my non-Catholic upbringing confronting the aggressively Catholic culture of visual representation of holy and virtuous figures. 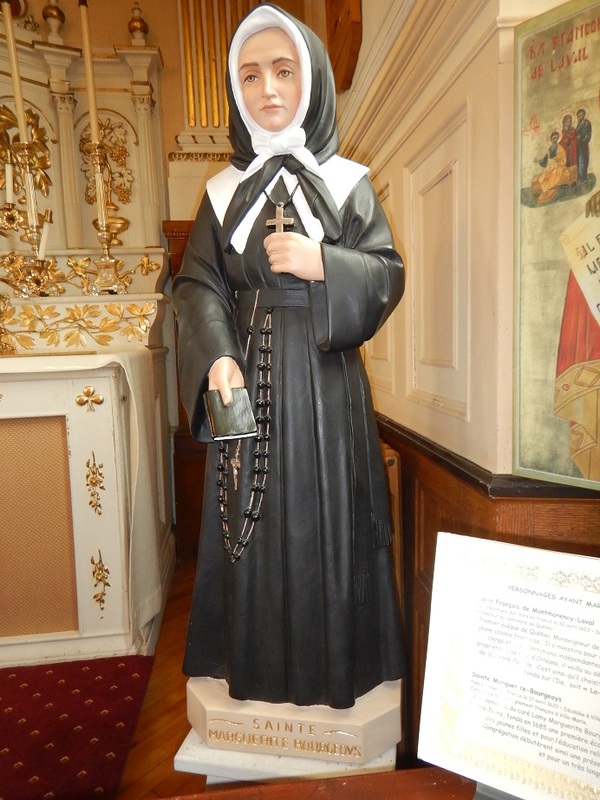 I’m down with it–statues like this one commemorating not just Catholic religieuses but also national heroes like Congregation de Notre-Dame nun Marguerite Bourgeoys, are all over the place. They’re in bronze on the Parliament building; they’re in every Cathedral, church, chapel, and gift shop. Seriously: walking around the antique stores on Rue St. Paul, most (if not all of them) feature not just children’s dolls for play, but loads of doll-sized statues of adults–mostly religious figures, but also just people in everyday life. I wanted to take pictures of them, but the glare on the shop glass would not have showed them well. No Infants of Prague that I saw, however–my favorite kitschy Catholic doll. This kind of freaked me out: the larger-than life terror-muppets like these in the Cathedral of Notre-Dame de Québec. 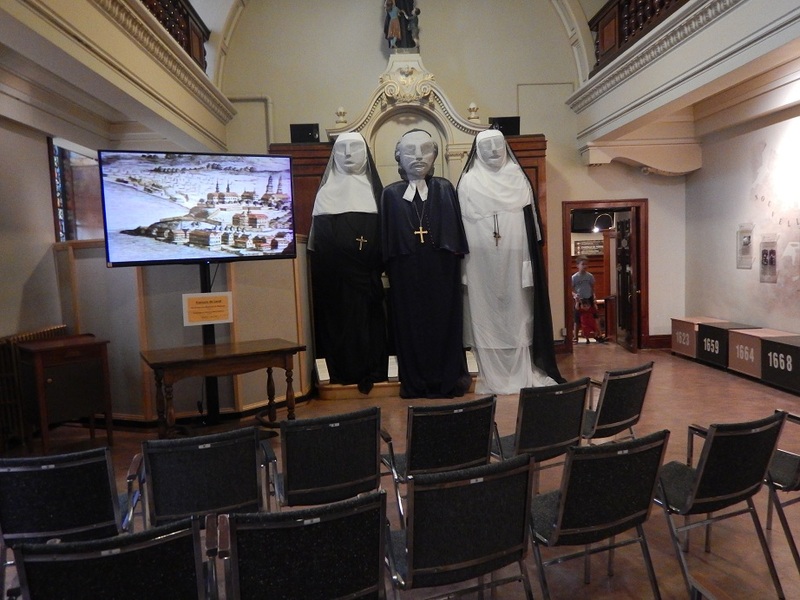 They’re meant to commemorate Québec’s patrimoine réligieux and the life of St. François de Laval in particular by representing (L to R) an Ursuline nun, a Jesuit priest, and an Augustinian nun. Kudos to the Cathedral for remembering the women of this city who did so much to propagate and preserve Catholicism over nearly 400 years! Go ahead and click on that picture on the right–I dare you! And let’s not even get into the interesting secular public art in this city. ← Was the American Revolution a mistake? Reflections from the true North strong and free. One of my colleagues posts a creepy doll series on Facebook. It seriously weirds me out. Once you start thinking about creepy dolls, you’ll see them everywhere. . .
yes, I thought I learned about it from you! And then a Michigander friend of mine actually made the trek, so epic. Historiann: History, sexual politics, and nun doll news, 1492 to the present. 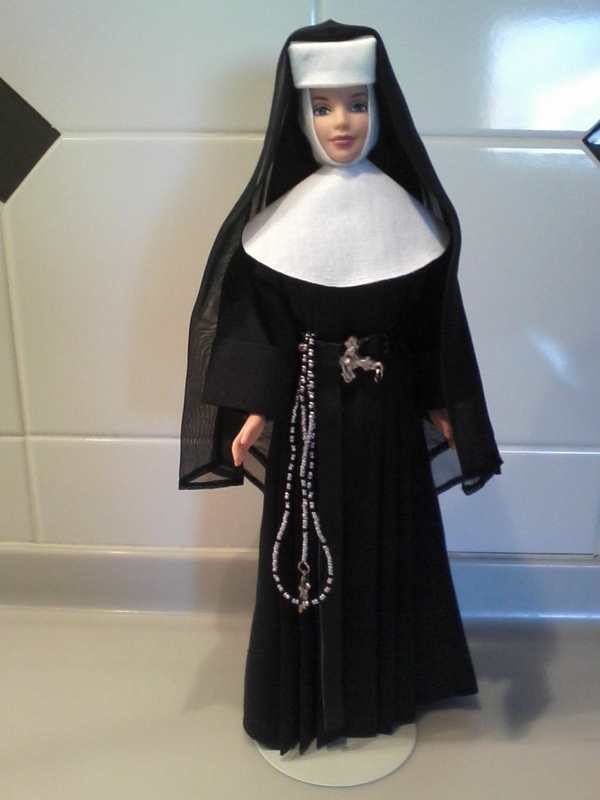 I forgot to mention in the post that I saw up-close an official Ursuline doll made in the convent in the 18th Century for educational purposes–showing the novices how to wear their habits, etc. I was not permitted to photograph it, & so can’t share pix here, but I’m securing a photo for The Many Captivities of Esther Wheelwright. This is a very well-made and completely non-creepy doll with incredible details in the costume: pockets sewn into the petticoat that goes under the habit, along with a tiny pin-cushion worn around the waist & over the petticoat but under the robe. In other words: the many layers of the clothing indicate the different kinds of work that the nuns did: prayer, teaching, & needlework. If you’re curious, you’ll have to get a copy of the book next year and check it out! This -this- is why I keep coming back to your joint Historiann! I always find stimulating posts and enriching conversations about everything under the sun. I had never thought about dolls and Roman Catholic material culture before. I was raised RC and you are right, there is something about dolls and sculpture more generally in the Church. I wonder if it has to do with the Counter Reformation and Post-Tridentine reforms? Those life-size dolls are fucked uppe!